by Andy Higgs in Features, Home, Peru, Places, South America. It’s impossible to consider the history of South America without mentioning its pre-Columbian civilizations and indigenous people who made a lasting impact on modern culture and left their mark on the landscape. Indeed this prehistoric history is one of the most alluring reasons to visit the continent and Peru is one of the best examples; a country whose magnificent archaeological discoveries pull in millions of visitors every year. The expense of getting to the sites is soon forgotten but the impression they make will stay with the visitor forever. 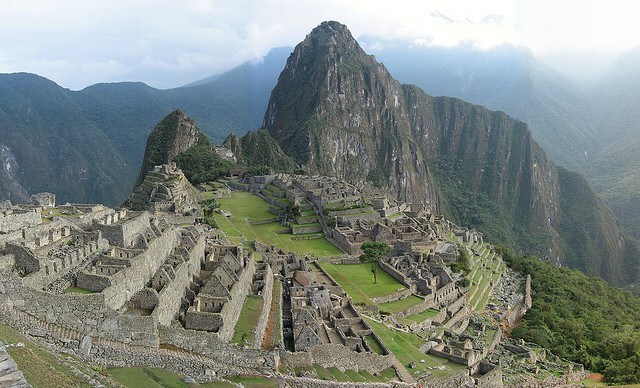 First of all we have to start with Machu Picchu, the lost city at the heart of the Inca civilization. The site itself is shrouded in mystery – it is impossible to accurately date the year it was founded but scholars agree that the last resident of Machu Picchu left in 1532 and that the city was inhabited for around three centuries. Even more remarkably, the city remained a secret known only to the Incas. The structure is also an architectural marvel and is very well preserved with its stunning Temple of the Sun in the Sacred District and the remarkable housing area of the Public District. Each stone was carved with a skill which speaks volumes with regard to the high development of Incan culture. 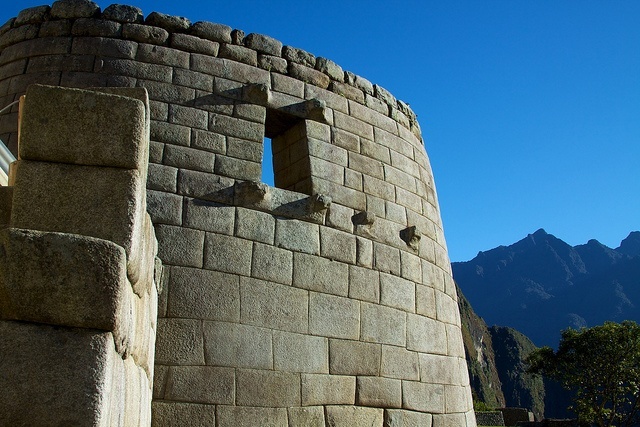 Visiting Machu Picchu, at an altitude of over 2000 metres, one gains a sense of both the golden age and the eventual decay of the Inca civilization. Another must-see in Peru is the enormous drawings (geoglyphs) in the Nazca valley in the southern part of the country. Most of them depict animals and plants made up of a mix of lines and geometric shapes. Serious study of this place started in the 1940s it became possible to fly over the area. There are many assumptions concerning the main purpose of the lines, but most relate to astronomy or that they were created to be seen by the gods of the people who made. Most of scientists agree that the Nazca lines were created between 400 and 650 AD and have survived due to the arid, semi-desert conditions. The Nazca valley is a strip of flat ground 37 miles long and a mile wide. The drawings – which include such animals as monkeys, dogs, spiders, whales and hummingbirds – were made by removing the dark purple granite pebbles which cover the floor to expose the light yellow sand beneath. The Nazca valley is a strip of level desert ground 37 miles long and a mile wide. Cuzco City, the capital of the Inca Empire, is located at an altitude of 3416 metres above sea level. Archaeological discoveries made in the area tell us that people already lived here some three thousand years ago, making it one of the oldest settlements in South America. Most of the castles and residential areas, much cherished at the time, were replaced by Spanish conquistadors in the 16th century, but they failed to spoil the breathtaking landscape of Cuzco. To learn more about pre-Columbian culture in Peru, one should visit Cuzco’s museums, most of which feature artefacts, documents and archaeological findings made in the area. One of them is the Pre-Columbian Art Museum that offers a unique opportunity to view ancient ceramics, woodwork, fabrics and the jewellery worn by Incan women – including gold and silver accessories. Travel agencies in Cusco also provide various excursions and trips to sites in and around Cuzco which demonstrate the historic value of the Incan capital. Cuzco is the centre of a network of spirit-paths (cerques) which radiate across the landscape. A road construction program was begun by the son of the ninth king, Inca Pachacuti (1438-1471 AD), which ultimately resulted in the creation of over 6,000 miles of road, including one from Quito in Ecuador to Talca in Chile which alone measured 3,000 miles. Although some remains and foundations of Inca buildings can still be seen, most were lost after the city was sacked by Pizarro in 1535. Today the major structures to visit are the palace of the Incas, the Temple of the Sun (Coricancha) and the Temple of the Virgins of the Sun. The Sechin complex in the Casma Valley was the capital of a pre-Incan culture based on the north-west coast of Peru. This city was occupied between 1,800 and 900 BC – making it almost a thousand years older than the far more well-known site of Chavin de Huàntar. An enormous mound was built – the largest of its time – which measures 990 by 825 feet and is 145 feet tall. The mound was finished with granite blocks, some of which weight more than 2 tons. It is believed that the huge scale of Sechin Alto may represent a 1000 year construction period. Inhabited for much of the second millennium B.C., Cerro Sechin is the most intensively studied site in the Sechin Complex. It covers approximately 50,000 square metres and comprises a three-tier stepped platform flanked on each side by two smaller buildings. The platform was built in several stages using large sun-dried conical bricks which were set in clay mortar and plastered over, thus creating wall surfaces. 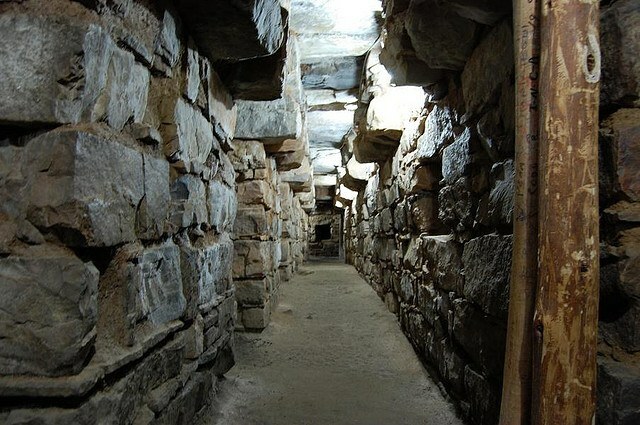 Chavin de Huàntar is a complex of steeply walled platforms and stone-lined passages which surround a sunken plaza. It is unique among Pre-Columbian temples and its main edifice, ‘the Castillo’ is faced with cut-stone blocks of varying widths. The walls rose 17 metres over a pedestal. Inside the core are at least three storeys of stone-lined galleries, chambers and ventilation shafts. The Gate of the Gods, or the “Puerta de Hayu Marca” was carved out of a natural rock face and is exactly seven metres high and seven metres wide. Its purpose has yet to be determined but the native indians of the area had a legend that spoke of “a gateway to the lands of the Gods” in which it was said that in ancient times, great heroes had gone to join their gods and passed through the gate for a glorious new life of immortality. On rare occasions those men returned for a short time with their gods to “inspect all the lands in the kingdom” through the gate. Jose Luis Delgado Mamani stumbled across the structure in 1996 while hiking through the foothills trying to familiarize himself with the area for his job as a guide for mountaineering tourists. “When I saw the structure for the first time, I almost passed out…” said Mamani in an interview with the local press. The Thirteen Towers of Chankillo run from north to south across a low ridge within a ceremonial complex in north coastal Peru which dated from the 4th century B.C. When viewed from observation points inside the adjacent buildings to the west and east, the towers formed an artificial horizon that spanned the annual rising and setting arcs of the sun. It is believed that Chankillo was a ceremonial centre and solar observatory in the Casma-Sechin river valley. 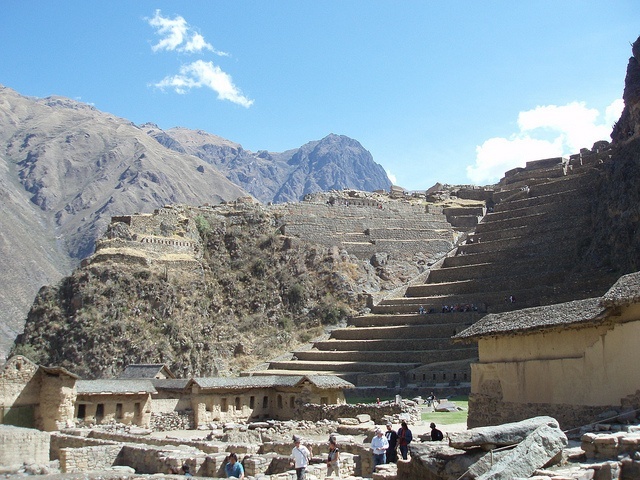 Ollantaytambo is a pre-Inca mountain citadel with rock walls of blocks, each of which weighs over 50 tons. Most of the blocks were quarried on a mountain seven miles away; they had to transported down one mountain, across a river canyon with sheer rock walls some 1000 feet high and then moved up the mountain on which the complex is located.